Man, oh man. I’ve seen Bonobo a handful of times before and each time I’ve been presented with a unique style, setting, and sound. 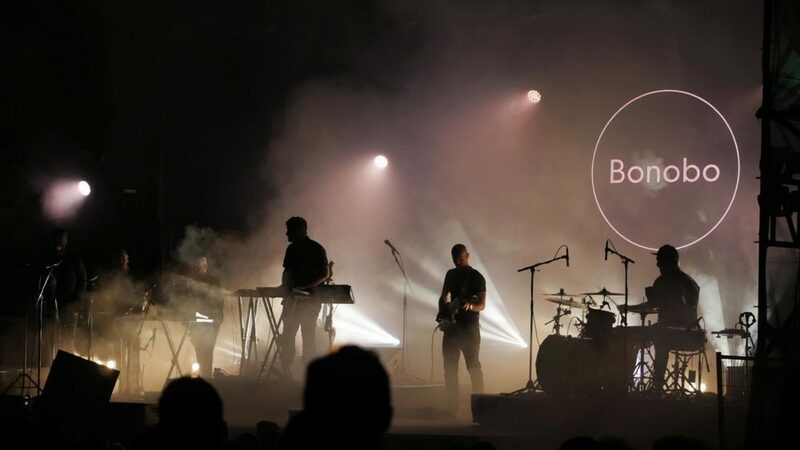 Although Bonobo retained the same visuals as were used during his first tour stop-off in Vancouver (The Commodore, May 2017), the outdoors setting of the Malkin Bowl was a fitting accompaniment to the visuals and, of course, Bonobo’s original music. As this was a live show, Bonobo, or Simon Green, was helped on-stage by guitars, a drummer, several sets of keys, a saxophone, a trombone, trumpet, flute and clarinet – at various times, as the hands and mouths of the skilled musicians could afford. Szjerdene joined on-stage for periodic vocal contributions and brought the stage to an uncrowded eight, at times. The band started up with the opening, titular song from Bonobo’s most recent album, Migration, and the crowd got a slow-rolling groove on with as they moved on to “7th Sevens”. Szjerdene came on-stage for “Break Apart” and The band ended “Towers” with a flourish of drums and guitar, and transitioned into “Kiara” with an off-beat drum loop that eventually synched up perfectly to melodically introduce the song. Szjerdene left the stage after “Kiara” and the band transitioned into several instrumental songs. The band was playing every note perfectly and adding highly-polished flourishes that were clearly the result of a practised band with a long stretch of playing on the road behind them. Whenever Bonobo cools things down and slows the music to a silent, grinding halt, you can bet your bottom buck on the fact that he’s about to drop a particularly juicy nut. I swear that’s a chipmunk metaphor. Well, delicious kernel delivered – in the form of the hypnotic, amazonian chant of “Bambro Koyo Ganda”. Bonobo lead-in with a minimalist “acapella” version of the tracks chanting and clapping, before the band joined in to complete the picture and bring the crowd into an ordered funk. This continued with the equally jungly, evermore fluty “Cirrus”, before things cooled down for a few songs. Szjerdene rejoined the stage and sang the always lovely “Pieces” in an even more airy, gentle, and beautiful manner than usual. The band quickly picked things up with “We Could Forever”, and at one point transitioned into what was, in my opinion, easily the most fun part of the show – a multi-guitar jam-out of what can only definitively be defined as Bonobo’s version of Sabbath-era metal. The crowd grew far more raucous than I’d grown accustomed to at even the danciest of Bonobo shows. It was grand. The band closed out the set with perhaps the most memorable song from Migration – “Kerala”. The band played a beautiful, extended cut before leaving the stage for like, thirty seconds while the bass pumped out and vibrated through the crowd. Subtle? No. The band came out for two more songs, exploring “No Reason” and “Know You” to a more intimate extent than on-album. The band did an extraordinary job on every song and presented what I believe to be a more whole and intricate version of Simon Green’s vision. I have seen plenty of variety from Bonobo, and I am now getting to the point where I’ve seen him enough live to begin to recognize growth. It’s a wonderful thing and I will continue to actively hunt the local Vancouver music calendars until the next day that Bonobo comes through town.